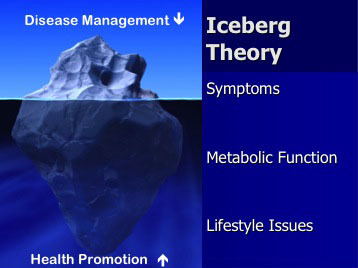 The iceberg model represents different approaches to address health concerns. A disease management approach primarily addresses symptoms, the results of imbalances in cellular and system biochemistry. If we believe that we are designed to be healthy and self-repairing, then it follows that optimizing intracellular and systems function will lead to an improved expression of health (fewer symptoms). To enable this repair and rebuilding process we must address diet, lifestyle, and physical activity as well as provide for relative nutrient deficiencies and enable normal metabolic detoxification. We feel that to accomplish desired long-term changes in health we must work from the bottom up, building on appropriate dietary choices and lifestyle habits then incorporating necessary building blocks for repair, which could include vitamins, minerals, amino acids, fatty acids, ancillary nutrients, and bio-identical hormones, sometimes supported with herbal or homeopathic agents. As metabolic function restores symptom patterns diminish and the closer to optimal function we get, the more ideal our responses.